The intrepid spies, pilots, and sharpshooters of Wraith Squadron are back in an all-new Star Warsadventure, which transpires just after the events of the Fate of the Jedi series! Features a bonus section following the novel that includes a primer on the Star Wars expanded universe, and more than half a dozen excerpts from some of the most popular Star Wars books of the last thirty years! 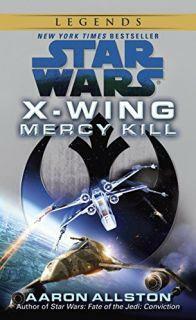 Mercy Kill is a Star Wars book that involves a group of spies called the Wraith Squadron that plan to bring down a corrupt Galactic Alliance general. This was a decent Star Wars audio book with the usual well-done audio effects but it doesn't live up to many other Star Wars stories. The team have an odd assortment of characters of different races and backgrounds but I didn’t feel I got to know many of them well in the story. I also felt that the end of the story was original but not very satisfying. That is why I give this book three out of five stars.